First of all, I was not able to make this thing for $20. If you don’t have a wide-mouthed, 32oz mason jar around, you have to buy them by the case, which run about $15 at your local hardware store. 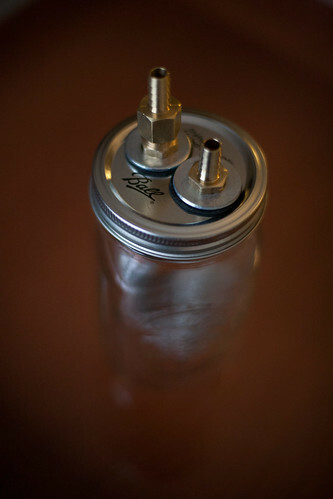 Also, I really like the idea of having a dip tube, and I didn’t have any copper tubing lying around. I guess I could have cut a piece off of my immersion chiller, but I didn’t want to risk ruining that. I got a roll (10ft was the smallest at Home Depot) for $20. So, I am already in it of $35, but with some very useful leftovers. So total, I am in it for about $70. Definitely cheaper than the hop rocket. It might not be as fancy, but gets the job done, and leaves me with extra parts to use for other things. I like making things, so it’s a good investment. I started by placing the washers on the lid to mark where to drill the holes. Then, just drilled them out and used a file to expand them as needed and to removed some of the sharp edges. Ideally, the holes are just about the same size as the threads so you have to screw the threads through the holes in the lid. Next, I wrapped teflon tape around the threads of male hose barb, and both sides of the compression fitting. Then I cut out the center hole of the rubber washers to fit snuggly around the hose barb’s threaded end and the 3/8″ thread of the compression fitting. After the threads and washers were ready, I just put the washers around the threads and worked the threads through the lids. This is the side without the compression fitting. Grab a couple wrenches and tighten this thing down as much as you can. I recommend using a tubing cutter (something like this) for this. You could saw it as well, but you’ll want to avoid just cutting it with scissors, as you will just crimp the end of the tubing closed. 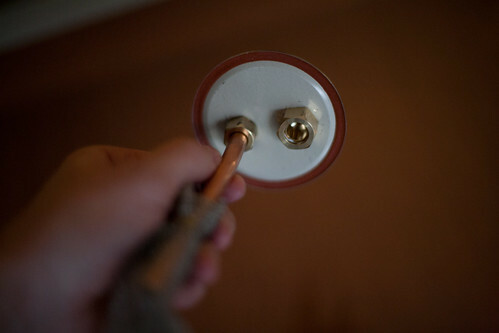 Your compression fitting should come with instructions, but the gist of it is to fit the collar around the edge of the tubing, place the spout inside the tubing, slide the nut on from the other end of the tube, and screw it down into the male end of the compression fitting as tight as you can get it. 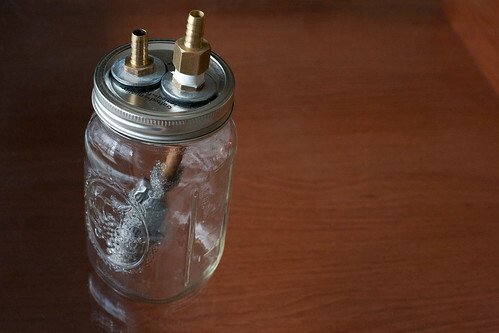 This will act as a filter to keep you copper dip tube from getting clogged. I first slide the trap up the tubing and clamped it on with a hose clamp. 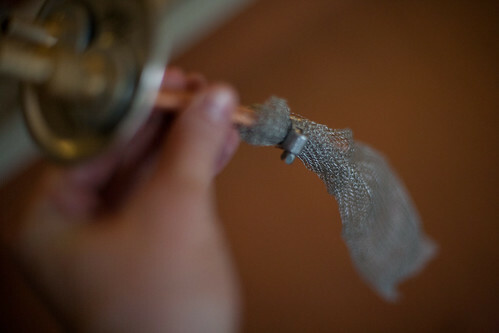 Then I wound the rest of the trap around the bottom of the tube to make several layers of mesh. Then I put another hose clamp around the fat part. My hose clamps were too small to fit, so I connected two of the together. Nice, it’s done! Just screw the lid onto the far and voila, you have a hopback! 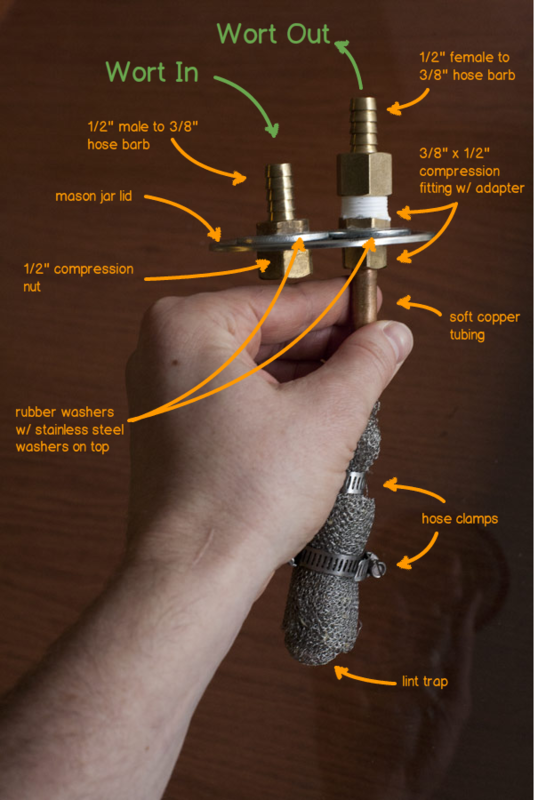 Before you use it, you should boil the dip tube with the hose clamps in it. I just filled up a small soup pot and rested the lid over the edge. The reason to boil this out for a good 20min or so is because there is some oil on the threading of the hose clamps and in the housing. You can boil it out, and not worry about it getting into your beer. This entry is filed under beer!, brewing, DIY and tagged hopback. Nice write up man, Definately on my future projects list! thank you for the idea and plan! build: I did a slight variation. Instead of the copper and lint trap I used a 3/8″, 1/2″ coupling and cut one side off of a stainless steel dishwasher hose. Pulled back the steel as much as I could and cut the rubber inside. Plugged and clamped the end. Cost about the same but was easier since I had done something similar for my mash tun and the uncut end screwed right into the coupling. use: put 6 oz of pellet hops in and it clogged up. I cleaned it out and put tea in it just to make sure it worked with something other than water and worked just fine. Next time I will be using leaf hops or putting the pellet hops in grain socks so they don’t clog the hose. I have only used leaf hops, although I was tempted to try pellets in a hop bad last week after accidentally buying all pellets instead of leaves for the hop back. In the end, I just decided to skip the hopback and toss my pellets in at flame out and leave the lid on the kettle while i chilled it. Let me know how the pellets in a bag works out. I might run a test in the meantime. I’m wondering if anyone has tried this with pellet hops in a grain sock. Do you need a march pump to push the wort through this set up or can it be done with gravity? This can be used with gravity. That is how I used it until a got a pump. The pump is a nice addition, but not needed. Thinking about making one of these, is it still running well? I am wondering if that lint trap ever gets clogged up with sediment. Is the 32oz mason jar large enough? Nice clever DIY project. I may make this but would like feedback on the muslin bag/pellet combo. I typically do 20gal batches so I have some challenges with the size of the mason jar. Pellets would be preferred simply because I buy in bulk and pellets seem to retain freshness in a vacuum bag. Glad you guys are getting good results from this. Do to my pellet and volume issue, I typically just use a 5gal paint strain bag and toss in a big old handful at flameout. Then the hops do the work as I get ready for the counter flow chiller. Sounds like fun and would put the wort in more direct contact with the hops. Thanks for the write up. Do they make really big mason jars? Do you not have to worry about the jar exploding when pumping 100 degree wort through it?